Please don't play "Turkey in the Straw" again: I'm not a big fan of whiny-type "you're doing it wrong" posts, but this list of 10 annoying social media habits of businesses has as many home truths as the fair's prize-winning jam. Who's gone to the (social media) fair? There's a new breakdown of social media demographics from Pew with some findings that might shake things up for you: "Hispanics lead the pack at 72% engagement, with African-Americans trailing at 68%, who are ahead of Caucasians at 65%...despite being somewhat economically disadvantaged, 72% of adults with annual household incomes below $30,000 use social networks, more than those with higher wages." There's much more in this deep dive. Gate receipts: Big companies (1,000+ employees) have big social media budgets. Get the breakdown here and see how they're investing and preparing and using social networks. Another trove. 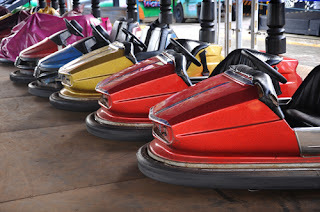 I liked the old bumper cars better: Miss your legacy media or just need a timewaster to make it to the weekend? YouTube now has a "tape mode" that recreates all the pops and hisses and even the pause wonkiness. Just add &vhs=1 to the end of any YouTube URL and you'll see what I mean. Best in show: Keep your eye on nonprofit social media with these winners of the YouTube DoGooder Video Awards. It's gonna be a bumpy ride: Talk about start-and-stop driving: Ever started a post update on Facebook, then thought better of it? You're then part of the 71 percent of folks who self-censor in this way on FB. Dangerous curve: Pinterest is now on the Nook e-reader. Don't say I didn't warn you before you bought your ticket. Can we drive these backward? You might be using it only to find the origins of photos you want to use, but then you'd be missing these clever uses for reverse image search. I'm not in this bumper car: No matter what you think, you will not find me quoted in People who spend all day online reveal how they get the most out of the Internet. But I'm not above stealing their tips. Just the steering wheel? Here are some handy workarounds for embedding just a portion of a YouTube video. Refreshing Your Blog, a half-day workshop June 6. Learn the trends and updated tactics you need to revive, refresh or renew your blog and make it work for today's audiences. Be an Expert on Working with Experts, a full-day workshop on June 13 for communicators and others who work with scientists, engineers and other subject-matter experts. Messaging Me, a 2-hour lunch session for job hunters, sharing the messaging tactics public speakers use so you can put them to work in your interviews.